last year, we’ve helped more brands capture the power of sight, sound, and motion in a simple and easy way. Today, we’re helping brands further understand the impact of their campaigns by bringing three new measurement features to AdWords for video that make reporting more consistent with other media, more goal-oriented and just plain prettier. 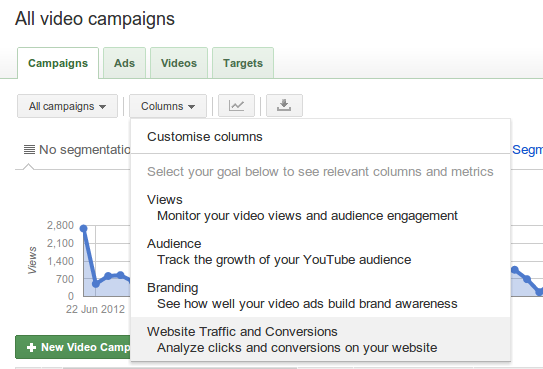 AdWords for video now displays reach and frequency metrics in your campaign reporting interface. These metrics give you more insight into how many unique viewers have seen your ad and the average number of times they’ve seen it, helping you better measure against other media such as TV. To view these metrics on a campaign, ad or targeting group level, just click on Columns >> Customize Columns and look under the Performance section. Want to build brand awareness? Select the Branding objective in the “Columns” drop down to see how broadly your video ad was viewed. We’ll automatically show unique viewers, average view frequency and average impression frequency. Want to optimize for conversions? Select the Website Traffic and Conversions objective to see how your video ads drove viewers to action. We’ll show you website traffic, number of conversions, cost-per-conversion, and your conversion rate from people who viewed your ad. Want to grow your audience? Select the Audience objective to understand how your video ads drove people to watch and engage with more of your content. We’ll show you follow-on subscribers and follow-on views. Want to drive more views? Select the Views objective to understand the follow-on actions viewers take such as when a viewer goes to your channel to watch more videos. We’ll show you follow-on views and unique viewers. Where in the world are your views coming from? With the new AdWords for video visualization feature, you can tell with a mere glance. Just select the Campaign tab and click “Map View” to generate a beautiful snapshot that displays view activity on an interactive map. 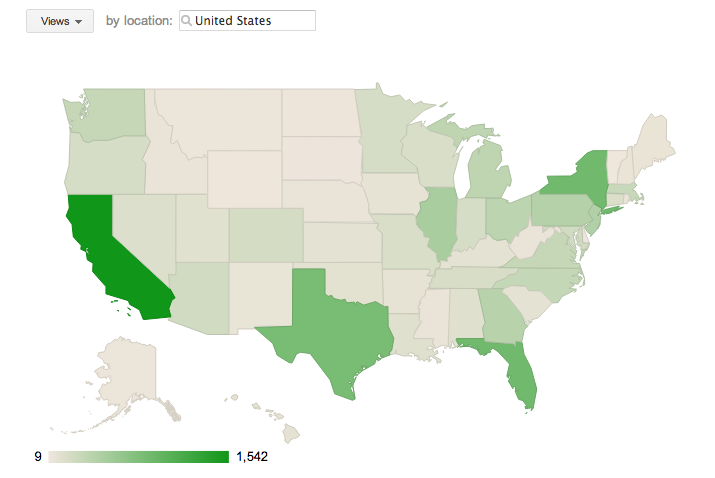 You can even click on regions to drill down to states and provinces globally, and to the DMA-level in the U.S. These geographic insights can help you understand which of your ad messages are resonating with specific markets. We hope these new features to help you easily compare campaigns across platforms, discover new metrics and derive actionable insights. Head over to AdWords for video to try them out today! Building a brand online is about creating authentic connections with your audience. Since launching AdWords for video last year, we’ve helped more brands capture the power of sight, sound, and motion in a simple and easy way. Today, we’re helping brands further understand the impact of their campaigns by bringing three new measurement features to AdWords for video that make reporting more consistent with other media, more goal-oriented and just plain prettier. for AdWords impression share (IS) reporting. As we mentioned in that initial roll, we’re continuing with our plans to phase out the old IS columns on February 4th. Any saved reports using the old IS columns will need to be updated to use the new columns. If you don’t remove/replace those columns before they’re retired on February 4th, you won’t be able to run those saved reports. Distinct search and display columns. We’ve added new columns to cleanly separate search and display impression share. “Hour of day” segmentation. We’ve enabled “Hour of day” segmentation so you can evaluate how your ad coverage varies by the hour. Filters, charts and rules. With the new IS columns you can apply filters, see charts, and apply automated rules using IS metrics. Device segmentation. Starting today you can also segment your IS columns by device so you can see coverage for desktop, mobile and tablet devices separately. For more information on what’s changing and what you may need to do, visit our AdWords help center, which has additional details. On November 7th we rolled out several improvements and changes for AdWords impression share (IS) reporting. As we mentioned in that initial roll, we’re continuing with our plans to phase out the old IS columns on February 4th. , provided greater transparency around the ads review process, and explained how advertisers can connect with us if we ever mistakenly disapprove good ads. Below is a more complete look at our efforts to combat bad ads in 2012. We will continue to do whatever it takes to keep our users, partners, and the web as a whole, as safe as possible. We have zero tolerance for bad ads and will keep working tirelessly to maintain the most secure advertising systems in 2013, and beyond. While most people are working on productive New Year’s resolutions, scammers and bad actors will begin 2013 with the same old goal: make money with the help of bad ads. Advertising helps fund businesses online and enables them to provide services and content for free to their users. But, bad ads can ruin your web experience, putting you and legitimate businesses in harm’s way. We have a vested interest in fighting bad ads and their sources with considerable firepower. Luckily, our ads quality team hasn’t changed its New Year’s resolutions either: stop bad ads and eliminate bad actors from our systems. In 2012, we continued to make progress towards this goal: we introduced new tools for stopping bad ads, provided greater transparency around the ads review process, and explained how advertisers can connect with us if we ever mistakenly disapprove good ads. Below is a more complete look at our efforts to combat bad ads in 2012.
, which lets you experience mobile ads exactly as your users will. The app lets you explore what best-in-class advertisers are doing with mobile rich media, and learn about all that’s possible with Google Mobile Ads. Additionally, agencies can use the app as their mobile portfolio by coding, testing and uploading their HTML5 ad examples to the MRAID-compliant “My Ads” screen. The app is now available for Android smartphones and tablets through the Google Play Store. See the app in action and learn more about how it works on the Creative Sandbox site. Smartphones and tablets can be great creative canvases for brand advertisers, and many agencies are helping brands go big on mobile. But it’s hard for agencies and advertisers to experience the full interactivity of mobile rich media -- mobile video and HTML5 ads -- through static images alone. Last night at our annual Creative Sandbox event in New York, we unveiled the new Mobile Ads Showcase App, which lets you experience mobile ads exactly as your users will. Happy 2013! As our New Year’s gift to you, we here at Google are launching a new “Under the AdWords Hood” Hangout on Air series. from the ground up in 2011, our team focused 2012 on delivering powerful tools to make managing the world’s largest search campaigns more efficient and effective than ever before. Our goal is to make search simple -- providing easier, smarter, and faster ways to manage your campaigns -- and integrate it with your broader digital marketing efforts in the DoubleClick Digital Marketing platform. I will remember important dates. Keeping track of anniversaries, birthdays, and other special occasions can be tricky enough. While Google Calendar can help you organize your personal events, DoubleClick Search has you covered the rest of the time, giving you reliable access to your campaigns on any day of the year without the worry of extended downtime and missed opportunities. Backed by Google infrastructure, DoubleClick Search is up and running when you need it most -- during critical dates like Black Friday, Christmas day, and throughout the holiday season. We’ll keep the lights on throughout 2013, so you can worry about finding that perfect anniversary gift. I will go to bed earlier. We get it; there’s just not enough time in the day. On top of back-to-back meetings, lunch dates, squeezing in some gym time and having dinner ready by 7, the last thing you want to do is manage a campaign that needs to go live at midnight. With DoubleClick Search, we help you get your life (and your search ads) on track with a set of scheduling features, including scheduled sync, scheduled UI edits, and scheduled upload sheets to effortlessly automate campaign changes around the clock. Coupled with easy bulk operations in the interface and ID-less uploads that have lowered bulksheet errors by 50% [cite: internal Google data], save time and your sanity by cutting out repetitive tasks. Go on and catch those extra zzz’s -- we’ve got it covered. I will be a better listener. No smartphones out during dinner. No talking over your friends. And no more ignoring key search insights. Just as listening to your friends and colleagues can mean more opportunities to develop better personal relationships, listening to your search campaigns can help you nurture better campaign results to meet your business goals. Our Performance Bidding Suite offers a variety of transparency features into the bid optimization process, including bid rationale, preview intended bids, chart bid history, and primary constraint to help you get down to the nitty-gritty of what might or might not be working. Are your min and max bids too constrained? Is your goal too aggressive? Just lend us your ear and we’ll help you discover those insights. I will spend more time with family. Your family is important -- they’re your bedrock, your confidants, and your circle of trust. That unified sense of integration and understanding is important to us, too. Because we know that search is one piece of a broader digital marketing “family,” we built DoubleClick Search to natively integrate with our display ad server, demand-side platform, and our rich media and analytics platforms -- all a part of DoubleClick Digital Marketing -- to help you take advantage of more opportunities across channels. Use Display remarketing from search ads to “close the loop” on paid search efforts, showing users display ads across major ad exchanges via DoubleClick Bid Manager, or across the Google Display Network. Then, call your mom. She misses you. Here’s to your best year yet. Happy New Year from DoubleClick Search! We know marketers are always looking to run better search campaigns by going bigger, moving faster, and taking new opportunities across formats, devices, and channels. Our mission with DoubleClick Search is to help them do that. Over the past year, we’ve further invested in making DoubleClick Search a best-in-class platform for search management to meet the needs of agencies and advertisers. We’ve often called 2012 our year of transformation: after rebuilding DoubleClick Search from the ground up in 2011, our team focused 2012 on delivering powerful tools to make managing the world’s largest search campaigns more efficient and effective than ever before. Our goal is to make search simple -- providing easier, smarter, and faster ways to manage your campaigns -- and integrate it with your broader digital marketing efforts in the DoubleClick Digital Marketing platform.